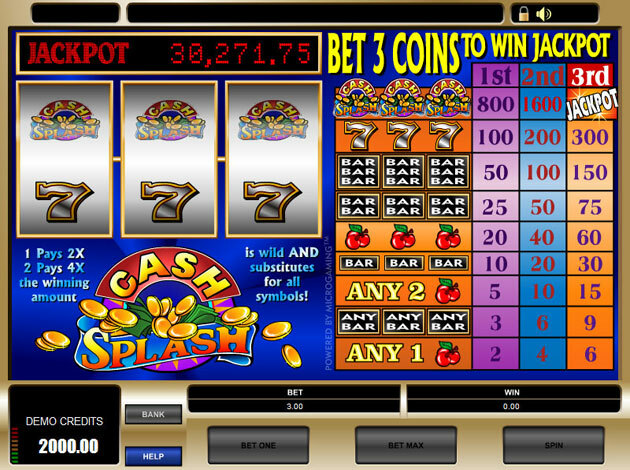 The popular progressive video slot Cash Splash is a three reel slot machine with a single payline. The Cash Splash video slot will provide you with the classic slot symbols like 7:s, Bars and Cherry´s, and you will feel like you are in Las Vegas playing for the really big bucks. However, there is one big difference from the old Vegas slots and that is the progressive jackpot. The jackpot will increase 24/7 until someone hits the jackpot, and then it will start all over again. The minimum bet is €1, but you have to bet the maximum of €3 to be eligible for the progressive jackpot, which resets to €5,000 and starts climbing from there every time it is hit. In other words the jackpot will never go lower than €5,000! The Cash Splash symbol acts as a wild symbol, a multiplier symbol and three of them on the payline wins the jackpot, which is sometimes can go well over €100,000. Using the Cash Splash symbol as a wild symbol doubles the amount won and if you land two of them it multiplies the win by four. The Cash Splash video slot also comes as a 5 reel slot and we are convinced that you will want to try both the 3 reel slot and the 5 reel slot and take a shot at the big bucks. Good luck!